Fr. Joseph speaks in Belleville, Ontario, at a seminar hosted by Holy Trinity Greek Orthodox Church. Lovely folks, lovely place. But like many of us, they have their work cut out for them—keeping Orthodox Christianity ALIVE in that little place. Here follows a few snippets from our time together. Recently I was blessed to speak in Belleville, Ontario, at a seminar hosted by Holy Trinity Greek Orthodox Church. Lovely folks, lovely place. But, like many of us, they have their work cut out for them, keeping Orthodox Christianity alive in that little place. Here follows a few snippets from our time together. Here's a very serious interview of a known-to-be-funny man; Fr. Joseph quizzes his "boss," Fr. John Salem, on the high calling of the priesthood. Halloween - Druids and Devils, Daughters and Dads and . . . . Dentists? It is only September, but stores are already displaying their Halloween "goods." What are we to make of this holiday as Orthodox Christians? 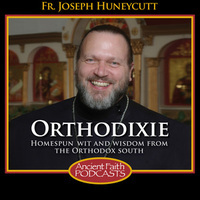 What Does an Orthodox Christian Look Like? Your Eminence, brother clergy, brothers and sisters in Christ, Christ is risen! Janitor, Banjo, Sideburns, a Nun: Opa! What's a Christian look like? It's all Greek to me! In this episode, Fr Joseph gets schooled by an imagined janitor, a native Houstonian, and a real nun.